Before you continue reading, click on one of the four options below that best describes your situation. What best describes you? Select from the options above. How you run your daycare or preschool is a unique reflection of what you most care about, what you most highly value. You’re likely here because more and more of the children in your charge are avoiding eye contact, not playing with the others, engaging in repetitive behaviours -- and worrying you or their parents. As an early childhood educator or child care provider, you have the potential to dramatically improve not only the entire future of the autistics you support, but of their whole families. I promise, this isn’t rocket science. It’s just hard because you’re looking at autism from the outside in, instead of understanding it -- and the relevant science -- from the inside out. I can help. We had the privilege of having Jackie present four workshops at our YWCA Cambridge Child Care Staff PD Day. It was a rare opportunity to learn from someone with firsthand knowledge of Autism. Our staff came away with an understanding of what someone with Autism experiences physically every day and strategies that will be useful in a child care setting to help support learning and reduce pain and stress for those children in the Autism Spectrum. The day was invaluable to our staff and they continue to benefit from Jackie’s information. How you run your classroom is a unique reflection of what you most care about, what you most highly value. You’re likely here because more and more of the children in your charge are avoiding eye contact, not playing with the others, engaging in repetitive behaviours, disrupting learning for others -- and worrying you or their parents. 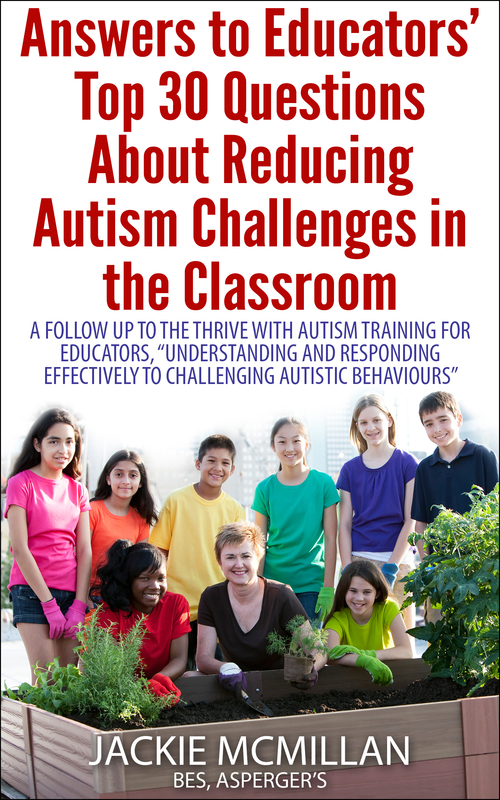 As an educational assistant or primary years teacher, you can easily create the optimal environments in which every child -- including those of us with autism -- will learn and thrive. I have learned so much from you and I am grateful. I love that you are able to speak from personal experience, a living example that your methods & research work. What I have learned is that autism is a product of our environment and not genetic - that surprised me. As a teacher I learned about the disease condition, but not really how I can help a child in my classroom. I leave each week feeling thankful that I am learning. May you continue to educate people. You are amazing! You’re likely here because more and more of the students in your charge are avoiding eye contact, not engaging with the others, involving themselves in repetitive behaviours, disrupting learning for others -- and worrying you or their parents. As an educational assistant or teacher, you can easily create the optimal environments in which every student -- including those of us with autism -- will learn and thrive. Thank you for all the information you presented in this seminar series. I found it really informative and eye-opening. I learned a lot that I want to implement not only in the lives of my students but also in the life of my family members. Very revolutionary in a way, however, mind opening at the same time. Information was good to hear. I plan on making changes at home, too! I feel that this is important for all of us. I found the information interesting and useful. Such a pleasure meeting you Jackie. Thank you for your passion. How you run your programs is a unique reflection of what you most care about, what you most highly value. You’re likely here because more and more of your students are avoiding eye contact, not engaging with others, stressing way too much, disrupting learning for others -- and worrying you. As a professor or services staff, you can easily create the optimal environments in which every student -- including those of us with autism -- will learn and thrive. Jackie shares a great approach to understanding about how to help autistics as part of a whole system which includes families, schools, and life rather than trying to address a single person in isolation. She shares a simple but holistic path to addressing a whole set of health issues that can be improved. What are this particular student’s unique symptoms saying? Don’t get fooled by that last one! There’s no such thing as high or low functioning. optimize our autism, and enable us to thrive! Those environments follow the exact same patterns, all around the world, for every single one of us. You have the potential to dramatically improve not only your classroom, but the entire future of the autistics you support, and of their whole families as well. We had the privilege of having Jackie present four workshops at our YWCA Cambridge Child Care Staff PD Day. It was a rare opportunity to learn from someone with firsthand knowledge of Autism. Our staff came away with an understanding of what someone with Autism experiences physically every day and strategies that will be useful in a child care setting to help support learning and reduce pain and stress for those children in the Autism Spectrum. The day was invaluable to our staff and they continue to benefit from Jackie’s information. If your students aren’t thriving with autism, do you know why?